I posted something yesterday to DataBreaches.net. I’m cross-posting it here today because I’m flabbergasted that eBay did not respond to inquiries by others and by me about this issue. In what appears to be a major breach of customer privacy, eBay is exposing customers’ real first and last names, as well as the items they’ve purchased, publicly on Google. While the idea that your real name is exposed in a product review you left for a benign product like clothing or books is disturbing enough, Google is also displaying eBay customer names for sensitive purchases such as medical diagnostic tests – including pregnancy, drug, and HIV home testing kits. Update: It looks like Google masked what eBay exposed. But why hasn’t eBay responded? If they are sending out data that they shouldn’t be sending out, maybe an FTC complaint might get them off the dime? DataBreaches.net tweeted an inquiry to eBay and will update this if we get a response. 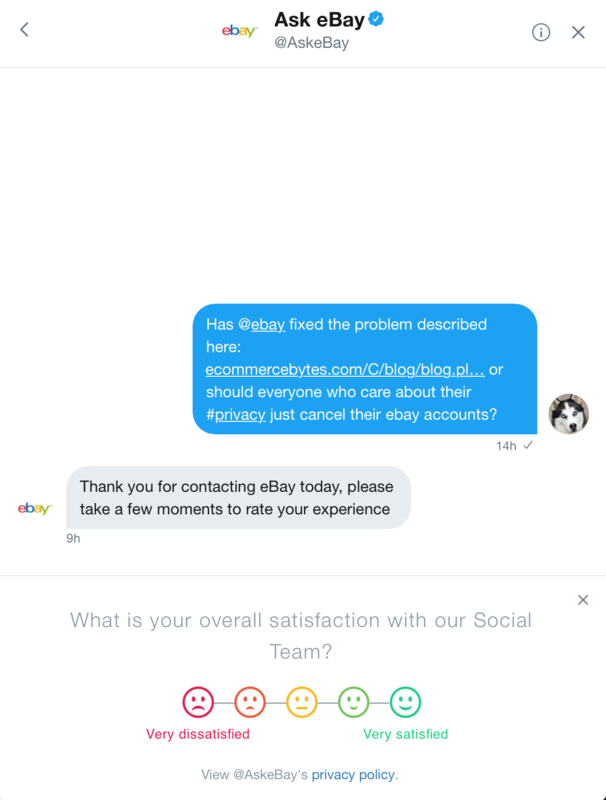 Me: Has @ebay fixed the problem described here: https://www.ecommercebytes.com/C/blog/blog.pl?/pl/2017/12/1512941047.html … or should everyone who care about their #privacy just cancel their ebay accounts? They asked me to rate my experience of them never answering me? Seriously? I gave them the worst possible rating for never answering me at all other than to ask me to rate their service. I also posted my query to them publicly in their timeline. And although their team has been online and answered many questions since then from others, they have not replied to mine at all. In the meantime, I do not think I will be so quick to rate any sellers or products on eBay.